NCCkl embraces you wherever you are in your spiritual journey as none of us have arrived. We are all Learning!! NCCkl unique NEXT STEPS growth process provides you powerful, day to day learning experiences to help you grow spiritually in the Gospel Word of the water and Spirit which constitutes God’s Righteousness. Everyone has the NEXT STEP!! Seekers : explore the claims of Jesus Who came by the water and Spirit. Believers : born anew and from above. Having three witnesses within one’s heart, the water, blood and the Spirit at all times. Disciples : becoming like Jesus by our obedience to the faith and walking sinless and righteous by faith. 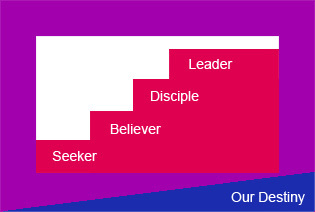 Leaders : sharing Jesus by leading others to take the NEXT STEP.